Guest blog provided by Erika Dowell, Assistant Director and Head of Public Services at the Lilly Library at Indiana University. Abraham Lincoln has a special place in the hearts of many Americans, especially those who grew up in the same places that Lincoln grew up: Kentucky, Indiana, and Illinois. The Indiana University Libraries has long had an interest in collecting book and manuscripts by and about Abraham Lincoln. In 1943, IU celebrated the purchase of an important Lincoln collection formed by Joseph B. Oakleaf of Moline, Illinois. Inspired by a biography of Abraham Lincoln, Oakleaf collected biographies, rare pamphlets, sermons, manuscripts, prints, and photographs. His materials joined the Lincoln books and manuscripts that were already part of the library’s collection in a newly named Lincoln Room in the IU main library. Today that building is known as Franklin Hall, but the Lincoln Room survives in the Lilly Library. Decorated in the style of the Lincoln White House, it displays paintings and sculpture depicting Lincoln (and a bonus sculpture of the collector Oakleaf). Its shelves hold much of the Oakleaf collection—the rest is in the Library’s stacks. Some of my favorite Oakleaf items are political prints, like the two pictured here. 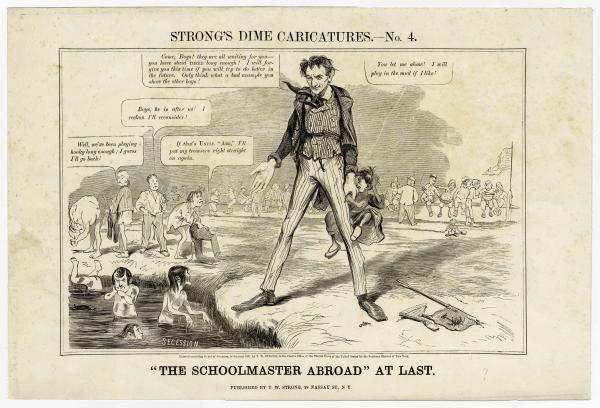 Published just before the outbreak of war in March 1861, “The Schoolmaster Abroad At Last,” shows Lincoln as a schoolmaster coaxing naughty schoolboys (southern states) out a pond labeled “Secession.” South Carolina is pictured biting Lincoln’s hand, shouting: “You let me alone! I will play in the mud if I like.” You can view the image up close and read all the text at IU Image Collections Online. Look for the “interactive view” to zoom in. 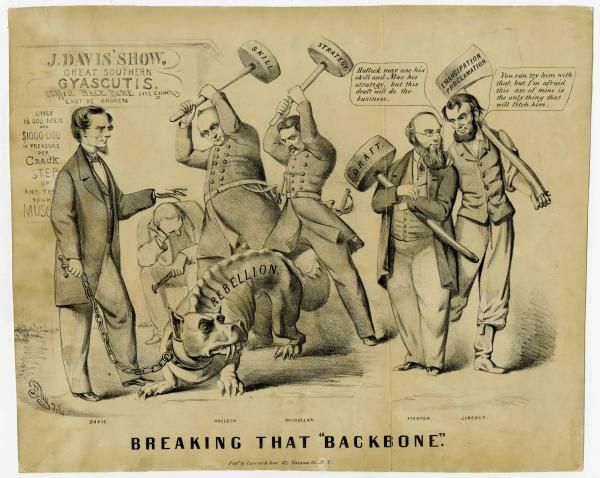 “Breaking that ‘Backbone’” shows the rebellion as a scary dog-like monster, held on a chain by Jefferson Davis. Around them are Lincoln, his Secretary of War and generals, each armed with a different weapon to defeat the beast. As is fitting, Lincoln holds an axe, labeled “Emancipation Proclamation.” This image was published by Currier & Ives in September 1862. 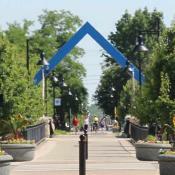 Click to see this image in more detail. The Lilly Library has continued to collect interesting Abraham Lincoln materials in the years since it opened in 1960. An intriguing letter relating to election irregularities came to the Library through our most important donor, Josiah K. Lilly, Jr. Lincoln wrote the letter to Illinois politician Norman Judd on October 20, 1858, just five days after the final Lincoln-Douglas debate held in Alton, Illinois. You can read the whole letter here. One of the most rare Abraham Lincoln items at the Library is a page from a notebook, known as Lincoln’s “Sum Book.” It is one of the earliest examples of Abraham Lincoln&apos;s handwriting known to exist. It probably dates from 1826, when Lincoln was 17 years old. 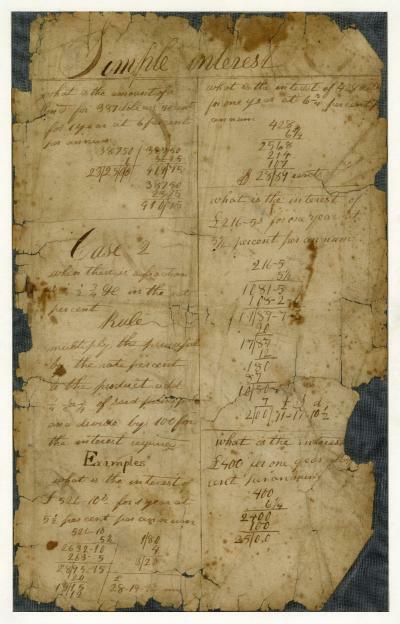 Each side of the sheet is headed "Simple Interest" and contains arithmetic problems, as well as handwriting exercises. Other leaves from the sum book are in the collections of the Indiana Historical Society, the Chicago History Museum, and the Library of Congress. We at the Lilly Library clearly love Abraham Lincoln. Why not spend part of Presidents’ Day exploring more of our digitized Lincoln materials? More caricatures are in IU Image Collections Online or go to the Lincoln manuscripts finding aid and browse. Find more caricatures and Lincoln manuscripts in the Lilly Library collection.